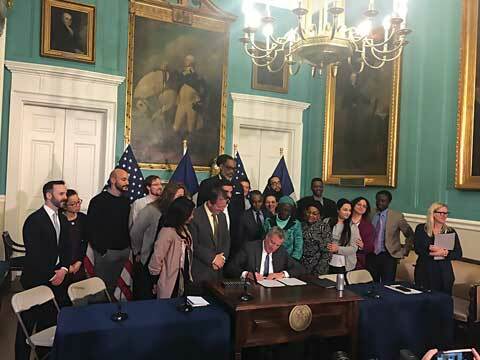 NEW YORK– On March 4, 2019, Mayor Bill de Blasio signed landmark legislation to create a pathway for transforming certain basement and cellar apartments into safe, legal, affordable homes. The new law establishes a three year demonstration program to facilitate the creation and renovation of apartments in the basements and cellars of qualifying one and two family homes in Brooklyn Community District 5. “There are thousands of basement apartments in our City, but too many are illegal and unsafe. This program will help New Yorkers secure safe, affordable homes and give homeowners a new legal source of income,” said Mayor de Blasio. Residents in illegal basement and cellar apartments typically have no lease, limited rights, and live in substandard conditions. This new law will add to New York City’s existing housing stock by allowing property owners to create safe, legal, and affordable apartments in their buildings. The City will also use the pilot to learn about how to overcome barriers that owners face when seeking to convert basement units. Last summer, the New York City Department of Housing Preservation and Development released a Request for Expressions of Interest to identify a Community Based Organization to administer the program. HPD will partner with Cypress Hills Local Development Corporation (CHLDC), a local non-profit that will subcontract with four community non-profits. The program will provide eligible low to middle income homeowners living in one to three family homes in East New York and Cypress Hills, Brooklyn with low or no interest loans to convert their basements into safe, legal, and rentable apartments based on the altered Building Code. The homeowner will also be provided with the technical assistance needed to close on a loan and complete the construction project. Homeowners can learn more by calling 311 or visiting nyc.gov/basementconversion. Modifications of code standards include minimum ceiling heights and window sizes in basement and cellar spaces and strengthens requirements for emergency egress and fire safety. Each proposed modification to the code standards for this program took into account the health and safety of residents. The changes will modify requirements in order to reduce costs and facilitate conversion of new residential units. Brooklyn’s Community District 5, including East New York, has an existing building stock of one and two family homes that makes it ideal for the launch of this program. The basement conversion pilot program was a commitment made under the East New York Neighborhood Plan, and is the result of a study conducted by a working group convened in October, 2016. This working group was comprised of Administration officials, elected officials including Council Member Espinal, Community groups, residents and housing advocates including CHLDC, Community Development Project at Urban Justice Center, CHHAYA CDC, Pratt Center for Community Development, Coalition for Community Advancement - Progress for East New York/Cypress Hills. “Converting basement units into safe and legal housing is an important way to address New York City’s affordability crisis,” said Council Member Brad Lander. “This pilot program will create affordable housing for tenants, financial stability for homeowners, and investment in East New York. It will also enable us to learn useful lessons to smartly expand the program to neighborhoods around the city in the future. Council Member Inez Barron said, “This bill will increase the stock of safe and quality housing in a city where housing is imminently needed. The number of people who are homeless, rent burdened, ‘couch surfing‘ and living‘ doubled up‘are representative of the need for safe, pleasant, affordable housing. Currently, thousands of people across the city are living in basement apartments that are not registered with the city and that have not been certified as meeting the standards, codes and requirements of the city.